Densho is bringing World War II veteran Virgil Westdale to Seattle to give a free author talk on Saturday, May 22, at the Densho building (1416 S. Jackson Street) from 3:00pm to 5:00pm. 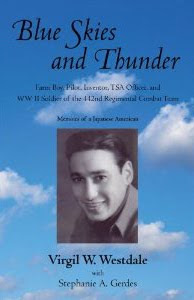 Westdale’s book Blue Skies and Thunder, coauthored with Stephanie Gerdes, traces his life from boyhood in rural Indiana, to service with the 442nd Regimental Combat Team in Europe, to postwar careers as inventor, businessman, ballroom dancer, and TSA officer. During World War II, Westdale was demoted from Air Corps flight trainer to Army private because his father was a Japanese immigrant. With the 442nd he helped push the Nazis out of France and assisted survivors at Dachau. He was among the veterans honored as camp liberators in an April ceremony at the United States Holocaust Memorial Museum in Washington, D.C. No tickets are required for the book event.